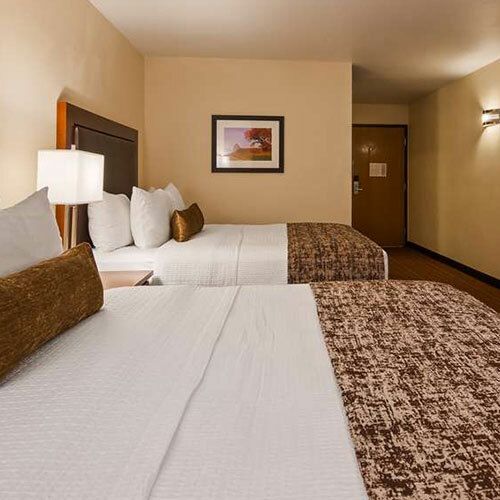 Rooms offer soft bedding, well-coordinated furnishings and 40-inch flat-panel TVs. The large pool area features a children's play section complete with water slides. The lounge area, which has a billiards table, is a great place to unwind or watch the big game. Smoke free premises. 80 units. 3 stories, interior corridors. Accessibility (Call). I-90 exit 28 (SR 16), just w. 4445 Theatre Rd 54656.
sauna, hot tub, exercise room. 2 night minimum stay - seasonal and/or weekends, cancellation fee imposed, pet friendly (call for restrictions/fees. ).